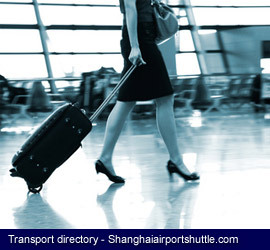 Shanghai airport shuttle : Ground transportation between Pudong airport and downtown Shanghai hotels. Welcome to the airport shuttle - Ground transportation portal for Shanghai City: This website provides information about transfers options offered to travelers from and to Pudong airport - The main airport serving Shanghai : Taxi, coach services, airport shuttles, private chauffeur car hire and Maglev Train - The fastest rail service in the world. Our site also features a selection of places to see and things to do or not to be missed when visiting Shanghai - The Pearl of Asia.